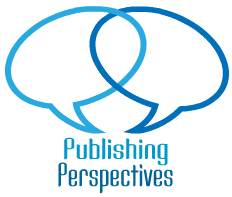 Publishing Perspectives is an interview series here on the blog that's all about seeking insights from people on both sides of the publishing fence ―the folks who work in publishing and the writers working toward publication. One aspect of publishing that hasn't been covered in the series before is academic publishing, but today we're breaking the mold. Below, Carmen Milagros-Torres shares her view of Puerto Rican children's and youth literature from inside the halls of academia. Carmen is a children's writer and Ph.D candidate at the University of Puerto Rico whose main research focus is Afro-Puerto Rican children's literature. She's also a former contributor to Anansesem and she and I took Maya Gonzalez's online children's writing and illustration course together earlier this year. I'm very excited both by the scholarly work Carmen is doing as well as her potential as a children's writer. Expect great things to come from her! I love to learn, and I especially love to learn about other cultures, so it was a delight to get the whistle-stop tour of Puerto Rican children's literature from Carmen. We traded emails recently and here's what she had to say. S.E. : First of all, I know you're in the middle of grad school studies and teach as well so thanks so much for taking the time out of your busy life to do this interview. Your pursuing a Ph.D in Caribbean Linguistics at the University of Puerto Rico with a special interest in Afro-Puerto Rican children's literature. Can you share a bit about your doctoral work? C. M T.: I want to first thank you Summer for the opportunity to share my love for children’s literature with your readers, especially the work from Caribbean writers. As you mentioned, I am in the dissertation stage of my doctoral studies under the mentorship of Dr. Alicia Pousada. I began my studies in Caribbean Linguistics at the University of Puerto Rico Río Piedras campus in the Fall of 2009. At that time I wanted to integrate Caribbean children’s literature within my Linguistics studies but had no idea how I would do so. In my first course, offered by Dr. Mervyn Alleyene, I started exploring race within children’s literature with the works of Fernando Picó's The Red Comb and Rebecca Tortello's Nancy and Grandy Nanny. This paper became the first step towards what became my field of research. S.E. 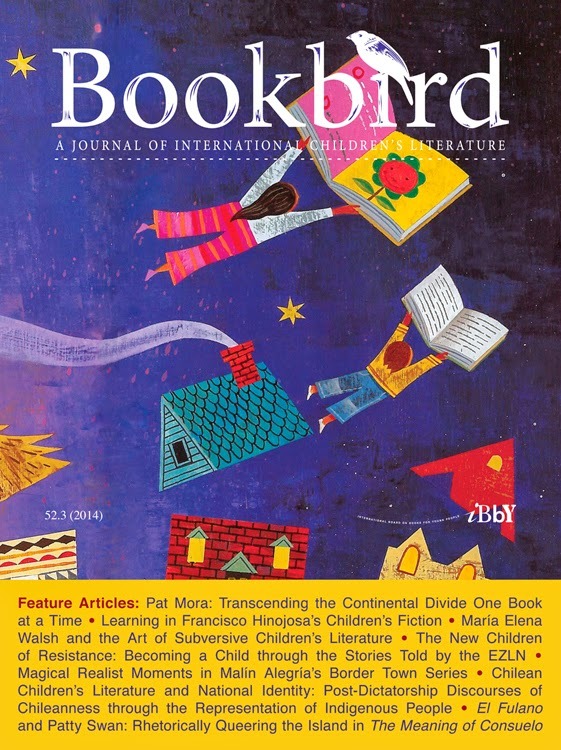 : Your essay titled 'Puerto Rican Children's Literature and the Need for Afro-Puerto Rican Stories' was published in Bookbird: A Journal of International Children's Literature this July (volume 52, number 3). As you note yourself in the essay, "there is an absence of documentation of the history and development of Puerto Rican children's literature", so when I saw the essay in Bookbird I had to reach out to you. What do you think explains the lack of research and can you see any ways to address it? C. M T.: Puerto Rico has had a very complex colonial experience. This is one of the factors explaining the lack of formal documentation of the development of Puerto Rican literature. Since 1898, The United States has played an integral role in the educational policies established in our island. This relationship with American culture has overshadowed the contributions of Puerto Rican writers who are many times better known in the diaspora than in their homeland. An example of this collective amnesia is Pura Belpre’s contribution to Puerto Rican culture in the diaspora. Very few people know about Pura Belpre’s lifelong dedication to keeping the Puerto Rican literary tradition alive. I was one of these people. I had taught children’s literature for over ten years at the University of Puerto Rico Humacao (UPRH) and had no idea of the importance of Pura Belpre’s work. It was only three years ago that I discovered her valuable literary contribution and nowadays I emphasize her work in my courses and mention that there is even an award named after the first Latina librarian at the New York Public Library. Teacher candidates in Puerto Rico receive their formal education from an American/ British perspective. Our students read great American works for children such as Charlotte’s Web, The Giver, and The Chocolate War just to mention some titles. But these teacher candidates do not read works that portray the Puerto Rican experience such as Carmen Bernier Grand’s In the Shade of the Nispero Tree. They graduate lacking an important component of their professional development. This reality continues in our educational system. Our public school system mirrors American educational policies in most cases especially when it comes to the teaching of English. The policy makers often just incorporate a methodology or approach that has been successful in the United States without taking into account the cultural reality of our ESL learners. This means that the resources used are American-focused and the Puerto Rican literary tradition continues to be ignored by educators and students alike. An example is the curriculum maps that were used up to the end of the 2014 academic year. 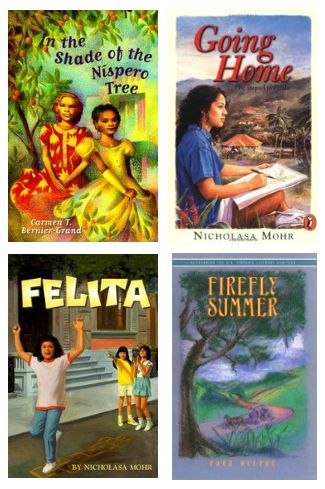 If we look at the suggested titles from 4th- 6th grade, there is only one Puerto Rican book, Esmeralda Santiago's memoir, When I was Puerto Rican. This reality should be of great concern for educators in the island. This situation is being addressed through a grassroots movement led by dedicated educators who wish to create a positive change in our educational system. Dr. Anibal Muñoz, English professor of the University of Puerto Rico Humacao is one of the forerunners in incorporating Puerto Rican literature in the English classroom. As an English teacher in the public school system he realized that students did not relate to the works assigned in the English courses. This inspired him to create his own literary work to meet the needs of young adult ESL learners. He has since published two English novels, The Cleansing of Unwanted Puerto Ricans and The Sweet Puerto Rican Money. He also published a collection of short stories titled Borincuan Times and just recently he published iPReople. His books have been used in public and private schools as well as at the university level with positive responses from educators and ESL learners. As president of PREWA (Puerto Rican English Writers Association), his goal is to ensure that culturally relevant literature is incorporated in the English classroom. PREWA works to make sure that works by local writers are included in the resources that the Department of Education (DEPR) provides students. They also organize forums; the first one was held in November 2012 at UPRH. The keynote speaker was Prof. Manny Hernandez, another educator who has contributed immensely to the incorporation of culturally relevant literature in the ESL setting. Prof. Hernandez is also an author who has published The Birth of a Rican as well as edited a compilation of culturally relevant works to be used with young adult ESL learners. S.E. 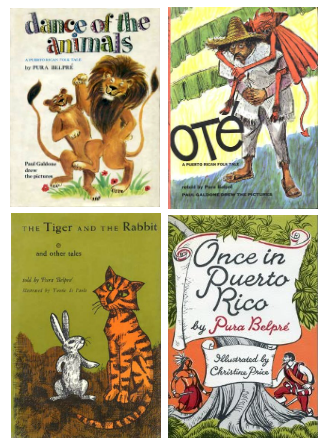 : From what I understand, Puerto Rican children's literature has traditionally had a strong folkloric or historical emphasis, echoing the focus of Pura Belpré, the renowned Puerto Rican New York City librarian and chidlren's author. This is something that continues today. However in your essay you state that "the folkloric representation of Puerto Rican culture lacks a balanced representation of the full extent of Puerto Rican cultural diversity." Can you tell us more about that? C. M T.: When most Puerto Ricans are asked to define their cultural heritage, it will be presented from an indigenous and/or European perspective. 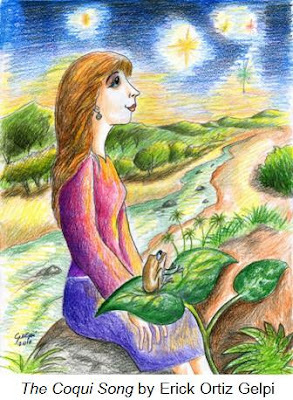 In children’s literature the coquí is a very popular figure that in our subconscious is linked with our indigenous heritage since these amphibians are native to our island. Juan Bobo is another very important character who is represented as a jíbaro. 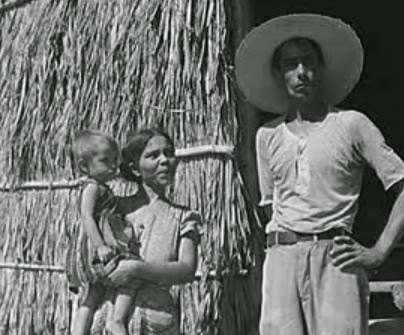 Jíbaros are represented in contemporary times with the stereotypical image of a white Puerto Rican as different studies have shown. An analysis of this portrayal is presented in the article “The missing half: Preliminary notes for a comparison of Juan Bobo and Bobo Johnny stories of Puerto Rico, St. Kitts and Anguilla” written by Dr. María Soledad Rodríguez and published in the 2003-04 issue of Sargasso. Pura Belpre’s beautiful book of legends titled Once in Puerto Rico documents many Puerto Rican legends.Carabalí by Cayetano Coll y Toste is the best known legend that portrays our African heritage. 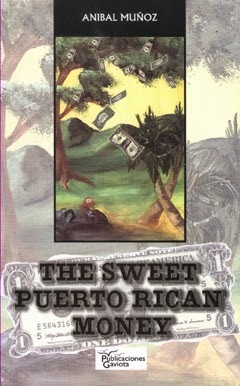 The book is a classic but not many Puerto Rican younger generations have read it. But even in this work, there is an absence of those Afro-Puerto Rican legends that must have existed once in our island. Puerto Rican society has silenced the voice of Afro-Puerto Ricans and this is reflected in the works produced. Within mainstream Puerto Rican children’s literature there is a lack of African or Afro-Puerto Rican characters. The books that have portrayed Afro-Puerto Ricans are mostly all out of print. Examples of these out of print titles are Ana Lydia Vega’s Celia and el Mangle Zapatero, Fernado’s Picó’s The Red Comb, Carmen Bernier Grand's In the Shade of the Nispero Tree and María Rijos Guzmán’s bilingual book Y llegaron los esclavos/ So the Slaves Came. 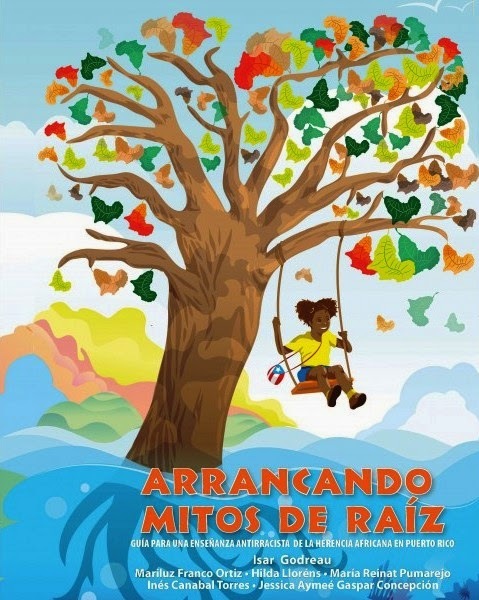 This lack of Afro-Puerto Rican children and young adult titles is evidenced by an Amazon search through the ezine Anansesem's online bookstore. This was one of my most important resources for identifying Afro-Puerto Rican children and young adult titles. Whenever I discovered a new Puerto Rican title in the Anansesem bookstore, I was able to purchase it as a used book. When I go to the few bookstores that still exist in Rio Piedras near the university where I study, most booksellers couldn’t provide any children or YA books with Afro-Puerto Rican characters. The bookstore Libreria Magica has been another important resource in my research. The owners of this bookstore have a used books section and I have been able to obtain other Afro-Puerto Rican books that I had no idea existed such as Lcdo. Marcos A. Rivera Ortiz’s Aventuras de la juntilla: Cuentos de Maturí. Children's books by Pura Belpré. She is known for her seminal adaptations of Puerto Rican folktales. S.E. : In your essay you write that "Puerto Rican children's literature is rich with the legacy of the legends of the Tainos." The tainos were the indigenous people who inhabited the island, and there are still Taino heritage groups living in Puerto Rico today. 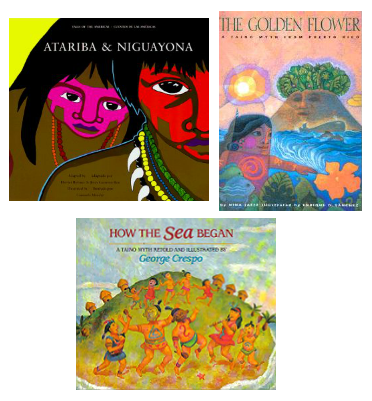 What do you see is the value of publishing children's stories from the Taino oral tradition? C. M T.: The Taino oral traditional must be kept alive as many great Puerto Rican writers are doing with their publications. They were the native inhabitants of our island. Their heritage flows in our blood along with that of the Europeans who settled in the island and the Africans who came here voluntarily (the mejías- free blacks) as well as those who were uprooted from their continent through the slave trade. One recent work for young readers that portrays our indigenous heritage is Ed Rodríguez’s Kiki Kokí which has appeared in its English and Spanish versions. 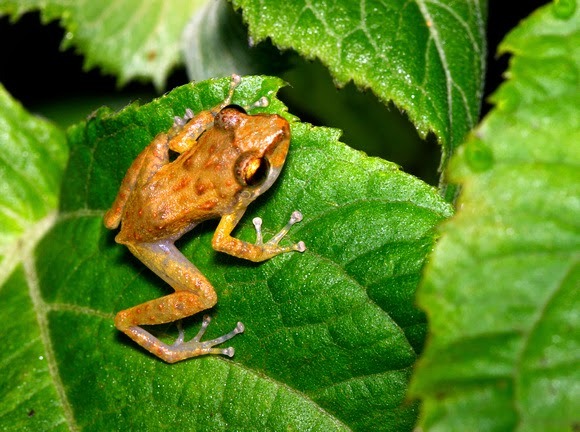 In this story we see how the coquí is interwoven with our Taíno heritage. Children’s writers should include in their future works the active role Taino women had within their communities. In the winter of 2007, I attended a New York University (NYU) winter workshop that was offered that year in Sagrado Corazon University in Puerto Rico. Participants were taken to the Ceremonial Park Tibes of Ponce where a guide gave us a tour and mentioned that Taino women had been caciques in their community. This information was so surprisingly new to us. I discovered in that moment how little we know of our culture. Even though there have been works published about the role of women in Taino society, these books are not known to the great majority of readers. 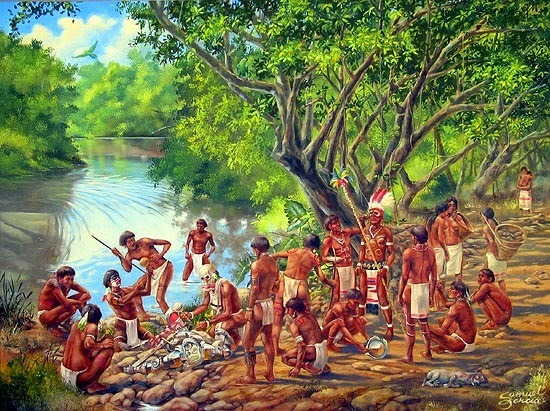 Artist's rendition of 16th century Tainos. S.E. : Juan Bobo, an iconic Puerto Rican folkloric character has also been the inspiration for many of the stories published for Puerto Rican youngsters. I think I read somewhere that something like hundreds of children's books about Juan Bobo have been written in Spanish and English. Can you tell us a little about this character? Where does the Juan Bobo character come from and why is he so popular? C. M T.: Juan Bobo is indeed an iconic Puerto Rican children’s character. 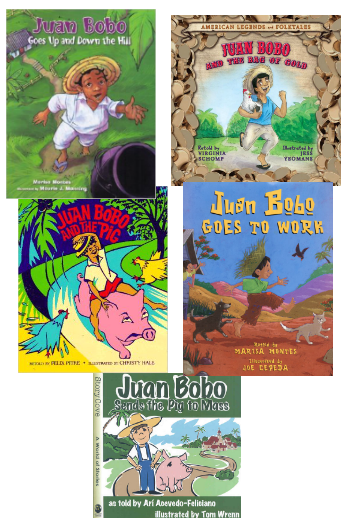 As you mentioned, the number of titles published featuring Juan Bobo is immense. As a child, my mother and grandparents in San Lorenzo would tell me of the adventures of this unforgettable boy who seemed to understand things differently from the way most people did. He has appeared in many children’s plays presented in Puerto Rico. He has also appeared in children’s TV shows such as the well-known program, En Casa de María Chuzema, sponsored by the public television Channel 6 in Puerto Rico. In this show, he was portrayed as a boy learning different educational skills such as the alphabet. I have not conducted any formal research on the Juan Bobo character even though he does appear in an unpublished novel I wrote years ago. In my story he is portrayed differently from the customary representation. From my first-hand experience, the appeal of this character can be compared with the appeal that Anancy spider has in the English-speaking Caribbean. Juan Bobo, like Anancy, usually gets away with his antics. While the adults get upset by his behavior, he demonstrates a valid point, i.e., if instructions are not clear, they are liable to different interpretations. By the way, thanks to the work of Casa Paoli of Ponce, I discovered that Puerto Rico also has Anancy tales. That is another topic for future discussion. Looking at Juan Bobo from the perspective of the jíbaro construct, I see this character as a rebellious figure resisting the feudal-like nature of Puerto Rican society after the abolition of slavery which has been portrayed by Puerto Rican writers such as Abelardo Díaz Alfaro. Jíbaros (mountain-dwelling peasants) were often labeled as lazy because they worked just for their needs and dedicated the rest of their time to “laziness” as some articles have discussed. But they were rebelling against the new post-abolition regime which forced them to work for the rich without obtaining any real economic gain aside from meager wages on which they barely survived. So I believe Juan Bobo stories show that the jíbaros, who were portrayed as naïve and vulnerable to being tricked by the educated, rich hacendados (estate owners), were not as stupid as believed. They valued their freedom and their refusal to work more than was necessary was a way of making a statement. Your question has sparked my interest in conducting research in this area. So in a future conversation, I would love to continue this discussion of the Juan Bobo character in Puerto Rico (for he has appeared in other countries). Juan Bobo, typically depicted barefoot, wearing a pava (traditional straw hat worn by Puerto Rican farmers), and with tattered pants. From Juan Bobo Goes to Work illustrated by Joe Cepeda. Juan Bobo as depicted by Jess Yeoman in Juan Bobo and the Bag of Gold. Juan Bobo picturebooks. Note the similarities and differences. S.E. : The coquí, a species of frog native to Puerto Rico, also shows up in Puerto Rican children's literature a lot. I've seen so many picturebook renditions of the coquí, it's quite fascinating. In your essay you cite Doris Troutman Plenn's 1950s book, The Green Song, as an early classic in the coquí tradition. How does one explain the appeal and longevity of the coquí in Puerto Rican children's literature? What do you think children find appealing about coquí characters? C. M T.: Animal characters appeal to the imagination of children. Many of the best known and loved children’s characters are animals or toy figures. I grew up enjoying Winnie the Pooh, the squirrel Miss Suzie, the mouse Miss Bianca, as well as Peter Rabbit. Many children’s books portray animals or toy animals as their main characters such as the Curious George books, The Velveteen Rabbit, and the well-remembered and loved spider Charlotte and her friend Wilbur of Charlotte’s Web. Contemporary books and children’s TV programs continue portraying animal characters such as the picturebook Olivia by Ian Falconer, winner of the 2001 Candelcott Honor award and the animated TV shows Peppa Pig, My Little Pony, Doki and Julius Jr. This year's Newbery Award was given to the book Flora and Ulysses written by Kate Di Camilo featuring a squirrel who obtains supernatural powers including the ability to write poetry. Since the coquí is a native of the island of Puerto Rico, it is the expected literary manifestation for Puerto Rican children’s literature; it has become the favorite animal to include in children’s stories written in our island. So when we look at the children’s books published in Puerto Rico and the diaspora, yes, the coquí is a very popular character. Popular bookxs featuring the coquí include the classic novel The Green Song by Doris Troutman, There’s a Coquí in my Shoe by Marisa De Jesús, and The Song of the Coquí by nuyorican writer Nicholasa Mohr. Even Puerto Rican actor, producer and comedian Sunshine Logroño published El coquí que quiso ser sapop/The Coquí that wanted to be a Bullfrog in 2007. In addition of the appeal animal characters have for young readers, there is also the reality that the coquí has become a symbol of Puerto Rican identity. A person just has to visit any artisan fair to see the coquí portrayed in many of the works these artists create. There is even a saying “Soy de aquí como el coquí” (I am from here like the coquí). The musical group Menudo, in their golden era in the 80’s, sang a song whose lyrics said “Oh, coquí, no hay nadie que ame tanto a nuestro pais” (Oh, coquí, nobody loves our country more than you). So the coquí has become synonymous with Puerto Rican identity for most of the inhabitants of our island. This is another reason why the coquí prevails in Puerto Rican children’s literature over other animals inhabiting the island like parrots or lizards. 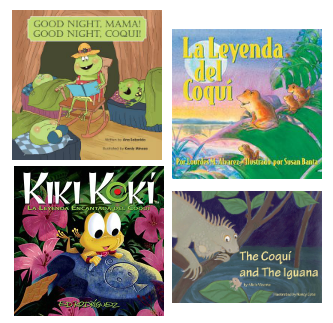 A few picturebooks featuring the famous Puerto Rican coquí. S.E. : You're writing a collection of children's stories titled "Coquíes, Drums and Dreams". I'm extremely excited about that by the way! You submitted three of the stories, "The Coquí Song", "Adannaya's Sugar" and "Dancing Bomba" to us over at Anansesem and we were happy to publish them. What can you tell us about the collection? C. M T.: Wow! I must first begin by thanking you and your editorial group for providing me with my first publishing experience. Having my work published in Anansesem motivated me to continue writing and even to dare to dream of someday publishing a collection of children’s stories. The stories that are part of the collection Coquíes, Drums and Dreams started as a writing exercise for a course I was taking in the Institute of Children’s Literature in 2009. 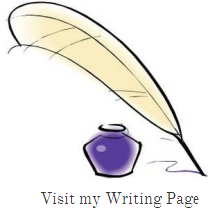 I wanted to write children’s stories but had no idea what to write about. During that same time, I was taking a graduate course with Dr. Alma Simounet and had finished reading the book Esclavos Rebeldes by Guillermo Baralt. In the book I learned that white sugar was prized over brown sugar due to the chemical process that it underwent making it more expensive. This fact prompted my idea for my writing assignment; the retelling of Rumpelstiltskin since I had seen how Patricia Storace had written the beautiful story Sugarcane: A Caribbean Rapunzel. That is the story behind “Adannaya’s Sugar”. The following semester, I was taking the course “Language and Power” offered by Dr. Nicholas Faraclas. We had an oral presentation and paper as our final work. I wanted to continue working with Caribbean children’s literature. At that time I read a very interesting essay titled “The Cinderella Complex” by Jean Dubino. Also during this same period, Disney had released their movie The Princess and the Frog which featured the first Afro-American princess. I did research to find out exactly how Disney broke away from its stereotypical portrayal of princesses. My discovery was that there were no major changes with Tiana compared to Cinderella, Snow White or Belle. As I was preparing my presentation, I got inspired to write a story in response to Disney’s stereotypical portrayal of female characters and “The ungrateful coquí” came to life. I presented the story to my classmates with a very positive response. The following semester, Prof. Vivian Mayol who worked at that time at UPR Río Piedras campus was coordinating a children’s writing competition. “The Coquí Song” had been published in Anansesem and a classmate commented about my story to one of the English professors who read and liked it. I decided to finally submit “The Ungrateful Coquí”. The jury, composed of Dr. Alicia Pousada and Dr. Robert Dupey, awarded first prize to this story which was such a surprise and honor for me. I decided that I wanted to continue writing Caribbean adaptations of fairy tales portraying strong Afro-Puerto Rican female characters. The short story collection will have eight short stories which include the two which were published in Anansesem as well as “Amapola in her Dream”, “Anything, but Black”, “Fat Girl”, “Roberto and Julia Eva”, “Shadows and Masks” and “Upon a Star”. These stories are part of my dissertation proposal. The dissertation is titled “Un-Silencing the Afro-Puerto Rican Voice”. The work proposes the use of culturally relevant literature to help ESL learners develop their language skills in English. The culturally relevant work proposed is from an Afro-Puerto Rican perspective due to the discovery of the lack of Afro-Puerto Rican portrayal in children’s literature. The short story collection Coquíes, Drums and Dreams is proposed as an alternative to begin addressing this need for Afro-Puerto Rican literature. The goal is to publish the short story collection after I successfully defend my dissertation in the near future. As soon as this becomes a reality I will share the good news with you. S.E. : Your husband, the Puerto Rican artist Erick Ortiz Gelpí, has often illustrated your stories. Do you plan to partner with him for this collection or on future projects? C. M T.: Erick Ortiz Gelpí has collaborated illustrating many of my literary projects such as the works that have appeared in Anansesem. For my short story collection he suggested that I should be actively involved with the illustration process. So for this short story collection I will be the illustrator except for the cover page which will feature Erick’s artwork. It has been challenging, but as he stated, fulfilling, for it becomes a project that has been produced through this literary and artistic experience. For future projects, he will sometimes be the illustrator as in the past. At other times he will act as a facilitator so I can express through art the literary message I wish to portray in my work. It will be a very interesting literary-artistic alliance. S.E. : In the essay you discuss some contemporary realistic children's books featuring Puerto Rican characters, some set in America like Grandma's Records by Eric Velasquez, and some set in Puerto Rico like In the Shade of the Nispero Tree by Carmen T. Bernier-Grand. In terms of themes and subjects, what are some contemporary trends in realistic Puerto Rican children's fiction? C. M T.: Puerto Rican children’s fiction has continued to be published but it doesn't have the support it needs so it can be accessible for a great numbers of readers. The disappearance of bookstores and the few publishing houses in the island has made the publication of children’s books a difficult task to accomplish. Since I have focused in the last six years on compiling of data about Afro-Puerto Rican literature, I have not had the opportunity to do formal research on new trends in realistic Puerto Rican fiction which is greatly needed. Efforts have been made to provide our young readers with high quality literary works. For eight consecutive years, the literary contest La Barca del Vapor has awarded the winning story publication through their publishing house. And the works are excellent. 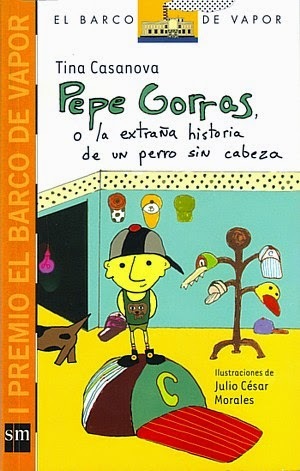 The recipient of the first award was the children’s writer Tina Casanova with her story Pepe Gorras, o la extraña historia de un perro sin cabezas/Pepe Gorras or the Stange Story of a Headless Dog which I greatly enjoyed. I also read the 2010 award-winning Dale la vuelta written by C.J. García and La escuelita do-re-misteriosa by Isabel Arraiza-Arana, also winner of this important award. The works appeal to young readers because they portray children in a realistic way and explore the concerns young people have such as the main character in the novel Dale la vuelta who is skeptical about adults and their knowledge since she can access anything via online search engines like Google. These works need to be more accessible for children. The titles I have had the opportunity to read are action-filled and humor is an important component within the development of the plots. Just two weeks ago there was a used book festival held in a mall in the south of Puerto Rico. Local bookstores had stands at this event. When I approached these stands searching for books from the La Barca del Vapor series, they had no titles available at the festival. That for me was very lamentable since an opportunity was lost for children to enjoy these works. S.E. 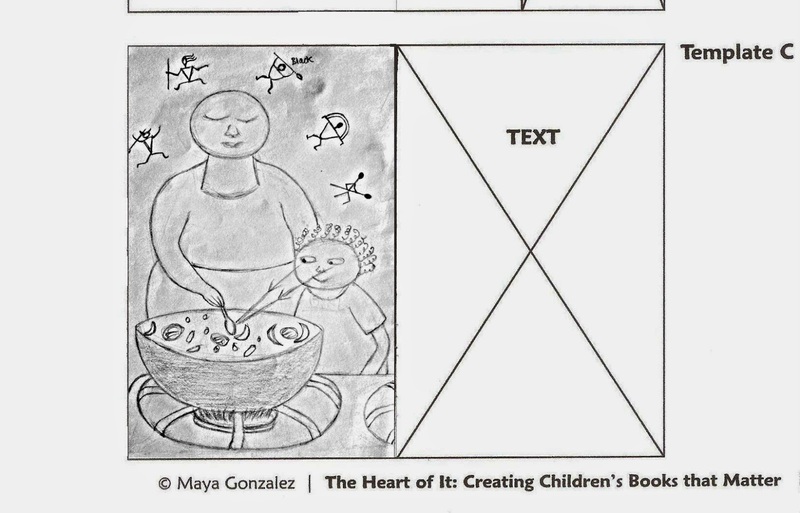 : We were both students in Maya Gonzalez's amazing online course, "The Heart of It: Creating Children's Books That Matter" earlier this year. It was so fun being in the classroom with you. What was that experience like for you and how do you plan to apply what you learned moving forward? C. M T.: The course “The Heart of It: Creating Children’s Books that Matter” is a course all children’s writers/illustrators should take. I took this course in the midst of completing my dissertation so there are many ideas roaming in my head looking for another opportunity to flourish under the mentorship of Maya’s creative suggestions. I grew artistically with this course. I dared to experiment with media I would never have used prior to the course. Another accomplishment that came out of this experience is that I wrote a contemporary fiction story which I wish to publish next year titled “Nieta de…” (Granddaughter of…). This story portrays a special granddaughter-grandmother relationship. 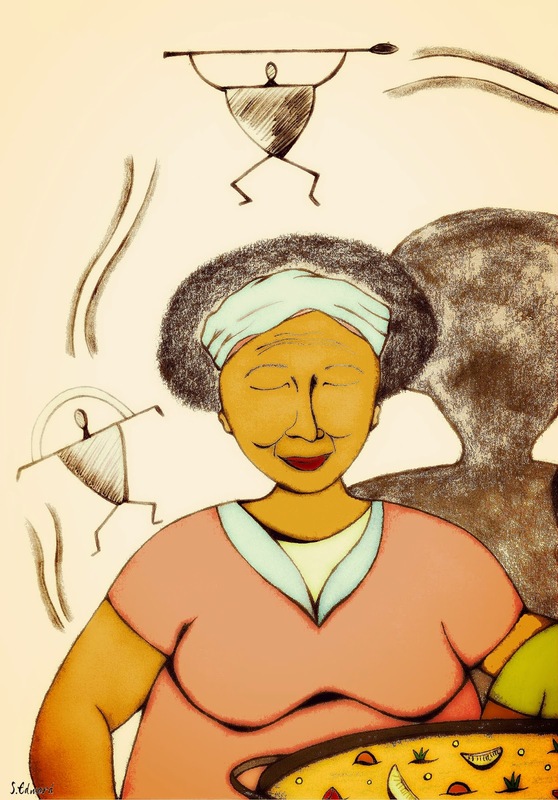 The grandmother is a very creative character who does not fear what others think of her and she is an Afro-Puerto Rican woman. 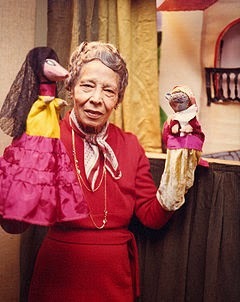 Her character breaks away from stereotypical portrayals of Afro-Puerto Ricans and elderly persons in contemporary times. The course also provided the opportunity to share with many talented writers and illustrators, like you Summer, who have inspired me to continue exploring my creative possibilities. It was a blessing to discover that there are many of us pursuing this literary dream of providing children with diverse experiences and to experience that community. All of the participants showed me the importance of giving a voice to the diversity that makes our world the magical place it is and of giving our children the voices that need to be heard in the books they read. So I want to formally thank Maya for her dedication to such an important cause. Before I end this interview I want to thank you once again Summer for the support you have given to Caribbean children’s literature. Your ezine has become a resource for those who, like me, want to discover the rich children's literature tradition and works for children produced in the Caribbean. Many of the accomplishments I have achieved in my graduate studies are due to the great work you have done in favor of the Caribbean voices of children and young adults. Now that I am on the threshold of completing this academic stage, I look back and can see the great contribution that you have made to this field. It has been an honor meeting you and your work. My goal is to continue collaborating with your cause in the future years to come. Carmen Milagros Torres is a professor at the University of Puerto Rico at Humacao. She is currently completing a PhD in Caribbean Linguistics and writing her dissertation titled “Un-Silencing the Afro-Puerto Rican Voice". Her interests include photography, crocheting and reading children's literature, especially Caribbean children's books which highlight the Afro-Caribbean experience. She sits on the Board of Directors of the Puerto Rican English Writers Association. Another 'Grannie's Coal Pot' update...what a journey this has been! 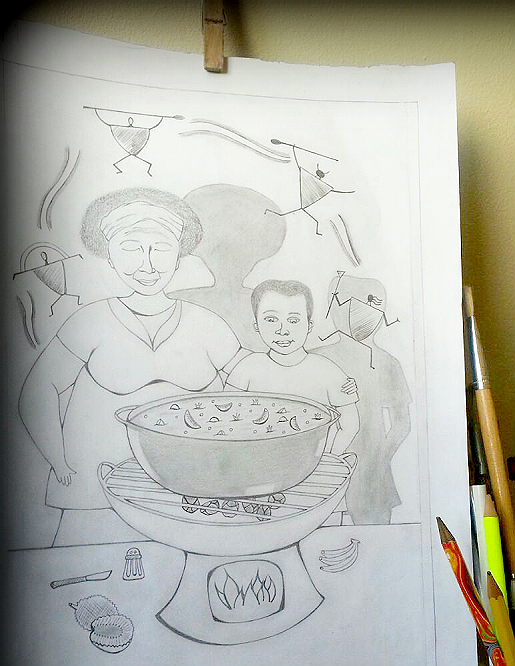 I was asked to make revisions to the final art for my 'Grannie's Coal Pot' illustration. The cave wall painting figure furthest to the right (they represent the boy's daydreams about his ancestors) has been moved off of the boy's shadow and repositioned above his head. Although I used the publisher's template to get the trim size right, the sizing got thrown off somewhere during the process of scanning the black-and-white drawing and so I was asked to add more bleed on all sides. I also made the skin tones of the characters' faces darker, and tweaked the saturation of the firelight glow. As usual, I'm very grateful for the publisher's guidance since the composition and all the other elements are working together much better now, and the illustration is now much truer to my vision. Hopefully this is the end of the road. Now that the final artwork is almost done, the publisher is working on their end to get the book ready for print…designing, laying in text, creating artwork and text for the front pages, formatting and all the rest that goes into creating a real live book. In a traditional publishing setting, this is the part where you finally get to relax knowing that your part in the process is mostly done and it's up to the designer and publisher to bring it all together now. Typically, you won’t hear much from the publisher until it gets close to the publication date unless they need something additional from you, like your bio, photo, etc. I hope these blogs about my experience creating an illustration for a children's publisher have been helpful to you. I'm looking forward to turning my attention to drawing and making art even more now. Today was an exciting day. I submitted the final artwork for the children's literature anthology project I'm working on. If you read my blog regularly you already know I'm working on my first illustration project and have been blogging about the process from initial thumbnails to final art. I said I wouldn't share the final art here on the blog, but I can't resist sharing now that it's done. I'm doing a single-page spread illustration to be published alongside a children's poem titled 'Grannie's Coal Pot' that I wrote. I'll let the poem be the element of surprise for those who buy the anthology when it's published. The publisher, Reflection Press may actually recommend changes to the illustration even at this stage of the process, or the Creative Director might tweak some aspects of the illustration during the process of designing the book, so what you see here is likely not really the final art. The illustrations you see here are not perfect in the sense of being examples of first-rate illustration skills. But they are perfect in the sense that working on this art has brought me so much joy and healed a lot of the doubts I had about my creativity. I love them because for me they represent a piece of my world, my culture, and my heart really, that will be shared with children through the pages of a book. 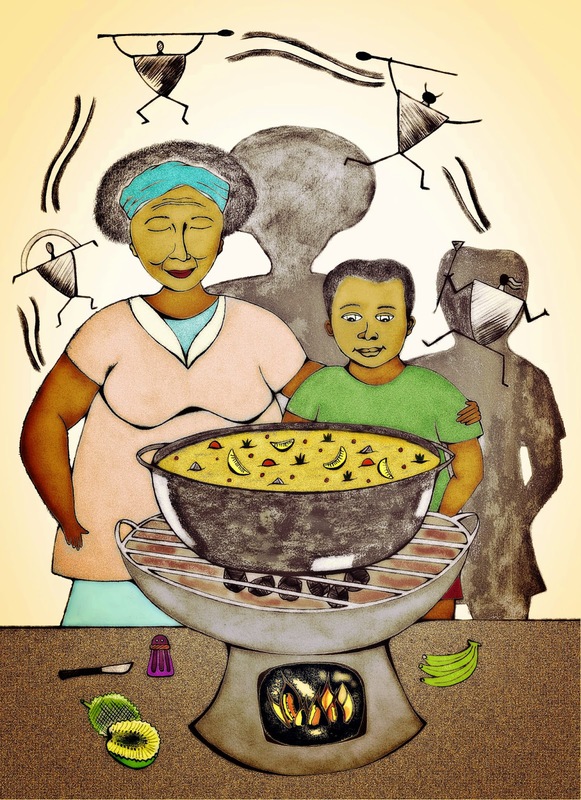 To know that a Caribbean boy and his grandmother embracing in front of bubbling pot of Trinidadian oil down has found a place in children's literature makes me very happy. This art represents an affirmation that I belong and I hope it helps others to know that they belong too. Another version. I couldn't get the faces this nice dark brown color in the other versions. The illustrations are not exactly what I envisioned when I set out to do this, but rather, they are what emerged organically as I let go of judgements of the art I was making and allowed the process guide me. That was not always easy to do. The process was not perfect. I stumbled a lot along the way. I procrastinated and got discouraged. I missed deadlines. And as a Photoshop novice I often just couldn't get Photoshop to do what I wanted it to do. Yes, I used Photoshop. I also feel like the colors are somewhat off but that's what the Creative Director at a publishing house is for, to fix those details. This project is an offshoot of the "Heart of It: Creating Children's Books that Matter" course I took through the School of the Free Mind earlier this year. When I enrolled in the course six months ago, I did not know I could create an illustration like this. I went into the Heart of It course with no artistic training. I'd been a lifelong doodler and longtime illustration buff, but that was as far as it went. I especially didn't know how to draw faces and hands, which is to say I hadn't yet discovered my way of drawing faces and hands. Drawing is really an art of seeing connected to a sense of knowing in the hands, and I didn't have that six months ago. I had no ability to see lines and shapes and I did not have trusting hands as an artist. That happened almost magically during this course. I used to hear people say "everyone is an artist" and I would wistfully think, "I wish." Now I really believe it. If I could get through this process and discover the artist in myself, then anyone can. Going through this process of creating an illustration from initial thumbnails to final art has given me a lot of insight into what can happen when people have somebody in their court who believes in them. 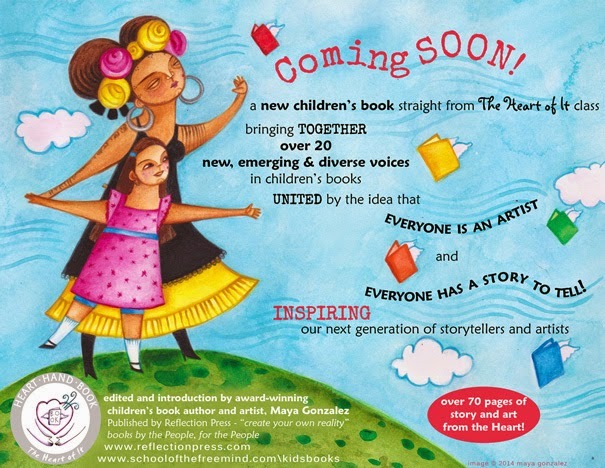 Maya Gonzalez and her publishing house Reflection Press have embraced a "mentorship publisher" approach to working with underrepresented children's writers and illustrators that helped me feel supported throughout the process. As I understand it, mentorship publishing is simply the idea that the publisher does not simply recruit and publish the talent, but rather, the publisher actively develops the talent by providing training, professional development, scholarship funding in some cases, and emotional support to writers and illustrators. It's about developing a relationship with the talent and building community through and alongside the creative process. This is what working with Reflection Press has been like. We have a Facebook group where everyone involved in the anthology has been posting photos of their art-in-progress and providing tons of emotional support to others in the community. We were provided with professional development and we have an experienced and qualified mentor-editor who uses a personal touch in the way she approaches feedback and instruction. The only reason I was able to do the course and subsequently end up working on this project is because the School of the Free Mind provided me with scholarship funding. People who paid to take the course have unanimously agreed that the returns have far succeeded the investment. I believe the mentorship publisher model is especially relevant for so-called "minority" communities who have long struggled to break into the traditional publishing world, including us in the Caribbean. People who have long had the doors of opportunity barred to them need a different kind of environment in order to thrive creatively. The need community and understanding, and they need practical support. Dare I say, they need a different set of standards. The standards of the traditional publishing world do not take into account the realities and histories of underrepresented communities. Right now, Ananssem, the Caribbean children's literature ezine that I run is on hiatus until 2015. Part of the reason we're letting Anansesem sit for a while is because we'd been feeling strongly that the ezine needs a new approach. We've always struggled with a low volume of submissions. I know it's not the interface itself because we've received so many compliments on the format and presentation of the site. I know people appreciate the existence of the site, because we've also gotten tons of positive feedback about that. Someone I talked to about the issue suggested that it could be a cultural thing, that Caribbean parents simply aren't warm to the idea of putting their children's writing and art on the Internet. I wonder if there is something to that. Another person told me somewhat bitterly that Caribbean people are apathetic, but I refuse to believe that. I'm starting to see now how a mentorship approach might be what is needed for Anansesem's future. Right now though, I'm waiting for feedback on the final art. And I'm dreaming about possibilities for us all. Please help us spread the word about the "Heart of It" anthology by sharing this beautiful flyer, thanks! I've been blogging about my first illustration project, a poem I wrote called "Grannie's Coal Pot" that I'm illustrating to appear in an international anthology of writing and art for children. I'm happy to be able to share a little more about this anthology. 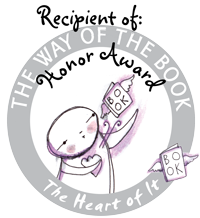 The anthology (title pending) grew out of the dynamic and powerful online course, "The Heart of It: Creating Children's Books That Matter" that I took with The School of the Free Mind earlier this year. It will be published by visionary Indie publisher Reflection Press and promises to be a wonderful and meaningful treasure for sharing with children and with our diverse communities. All of us contributing to the anthology are graduates of the course and we all have a heart for sharing stories and art with children that support and affirm a conscious, inclusive, socially aware vision of the world. We are about reclaiming and building a heritage of storytelling that respects and values children, multiculturalism, first voices, nature, gender diversity and the magic of the human heart. 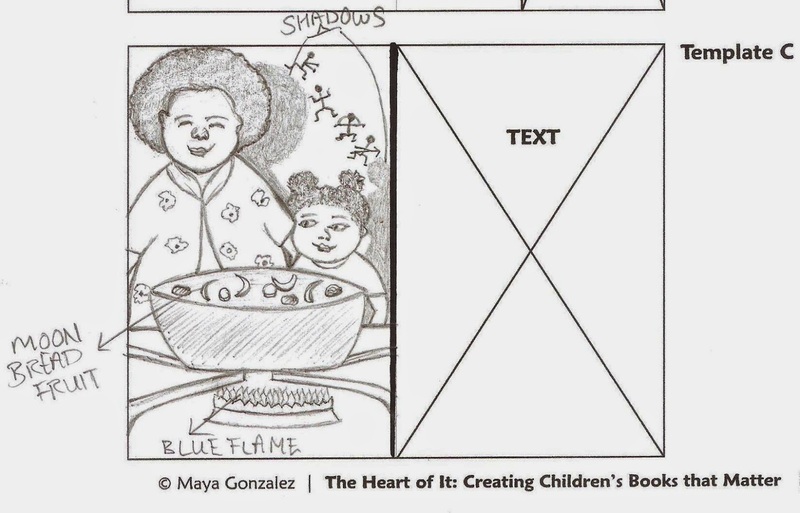 We are being guided on our Heartful publishing journey by Maya Gonzalez, our course instructor, Editor, and Heartful award-winning author-artist. I can vouch for both the heart and talent of the author-artists whose voices and art will commune on the pages of this book. Please help us spread the word about this revolutionary anthology (How is it revolutionary? Read this post over on the School of the Free Mind's blog to find out) by sharing the beautiful flyer above. And in case you're wondering about the "Heart of It" course, it runs again this October and you can find out more information about it and how to register here. Things are moving along steadily with 'Grannie's Coal Pot', my very first illustration project. The last time I blogged about this project, I'd just submitted the final drawing to the Artistic Director at Reflection Press. A week later I got an email requesting that changes be made to that drawing. I also received a mock-up of my double-page spread with the poem on one page and the illustration on the other so I could see how my spread would look as pages of a book. The changes I was asked to make were minimal and that was a relief. I'm not going to post the revised drawing here on the blog (or the final art either); the final art will be a surprise for people who buy the book. I shared in my last post how I ended up making changes to the illustration during the process of converting the final thumbnail to the final drawing. I should mention now that when working with a traditional publisher, it's very unlikely that changes between the final thumbnail stage and the final drawing stage would be approved unless they had been discussed beforehand. The point of the thumbnail stage is for all the details to be worked out and finalized. This is what the publisher is counting on. So during the thumbnail creation stage it's very important to spend a lot of time fully exploring all the options until you settle on your final choice. Since I'm a newbie to illustrating children's books and this particular project grew out of a class environment, my publisher gave me some leeway, but again, the standard procedure is that your final drawing should be the same as the final thumbnail, just with more resolution and detail. Once the revised final drawing was submitted, it was time to move on to the sample art, also known as the 'color sample'. Illustrating is not a wholly linear process and so I started working on the sample at the same time I was doing the final drawing revision. The art sample is meant to show the publisher what materials/media you're using and how. I say "how" because there are a million ways to use acrylics and then there is your unique way of using acrylics, which is what the publisher wants to see. So the sample art, along with the final drawing, lets the publisher know what to expect from the final art; it helps the publisher understand the palette (i.e., the range of colors you'll be working with) and the style of your artwork so they can visualize and design the book. The sample art can be a trial run of the illustration or a part of the illustration. It can be a character study using your medium of choice, or a landscape, or even a detail like a hand. For my sample art I zoned in on a section of the illustration. Clearly, the sample art stage is very important. You want to take time to really play with the materials you'll be using to illustrate the book. Because this is my first illustration project and I'm not quite ready to send my hand-painting out into the world as yet, I've decided to color my final art digitally and so my sample is colored digitally. I'm only just teaching myself digital illustration and I wish I knew more, but I'm working with what I've got. I'm hoping I can produce cleaner, sharper images when it comes to the final artwork. Believe it or not, I did 13 different versions of this illustration before picking 5 to submit. Here are two of them. I submitted the art sample today and now I await feedback. The next steps are revisions to the art sample (if required) and then it's on to the final art, yikes! I'm currently working on my first children's illustration project and blogging about it as I go along. I recently submitted the final drawing for 'Grannie's Coal Pot' to the book's Artistic Director for review. 'Final drawing' is actually a misnomer because the illustration is still subject to change at this stage of the review process. So the final drawing is more like a proposal for what the final art that will appear in the book will look like. Drawing, like writing, is a process of discovery. If you saw the thumbnails for this illustration that I posted before you'll notice some changes were made from what I'd originally intended. The plan was to have the child be a girl but as I was drawing, my pencil kept insisting it was a boy I wanted to draw. I remember when I was a child how much it irked me that my brother often got a free pass from helping out in the kitchen or doing chores around the house. Many boys and men actually do like to cook, and it's an invaluable skill for people of any gender to learn. Besides, why should boys miss out on the joys and pleasures of cooking? A boy in a cooking scene challenges the stereotype that only girls belong in the kitchen and sending that message felt true and right for this piece. I realized I also wanted to affirm the specialness and value of the relationship between a boy and his grandmother. I don't have a good camera but here is a picture I took with my cell phone. The final drawing. Let's hope it gets approved! Another thing that happened organically as I was drawing was the change to the coal pot. 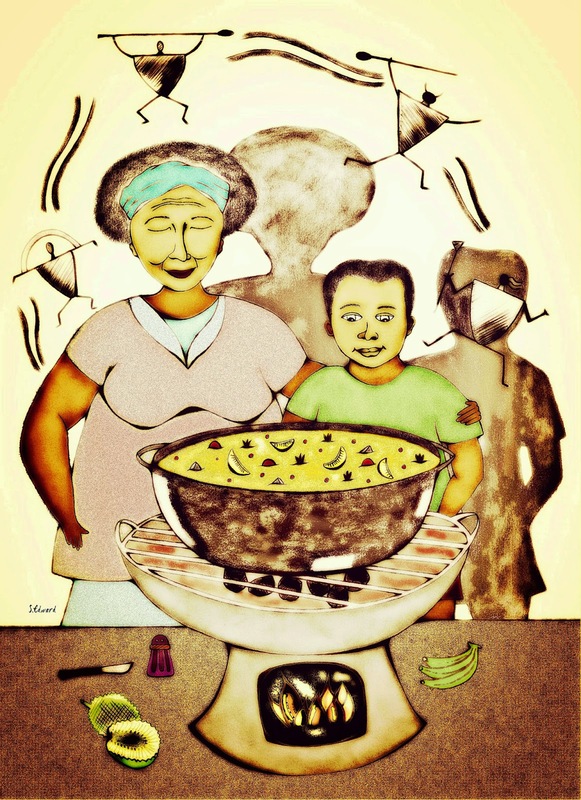 I'd originally planned to draw a regular pot on a stove-top, but a sudden memory of the old-fashioned coal pots of Caribbean folkways came flashing back. Street vendors in the Caribbean use these traditional coal pots a lot; in fact, coal pot cooking is something of a cultural institution in the islands. In Trinidad, there was even a soca song written about coal pots. 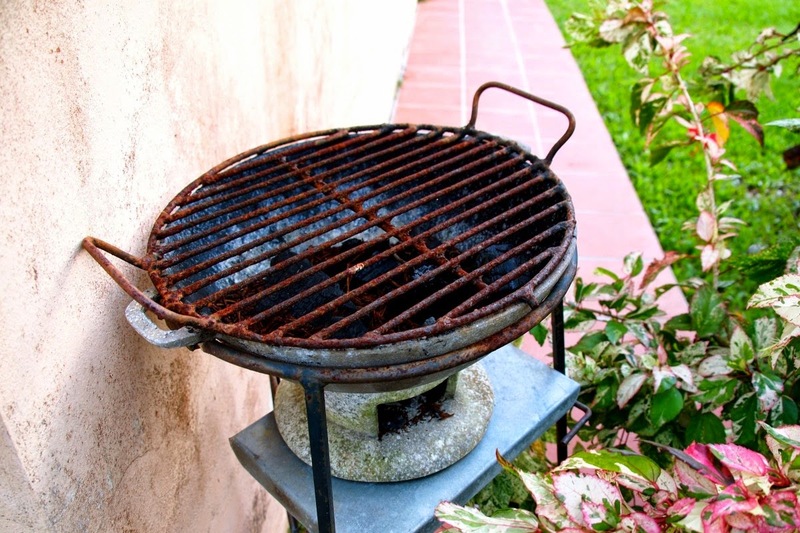 People will often use them to cook outdoors in their yards because outdoor cooking is also a Caribbean thing. 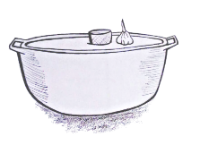 A grandmother would likely own such a coal pot, and cultural authenticity in children's illustrations is so important, so I gladly gave up the stove-top idea in exchange for the traditional Caribbean coal pot. Now that I've submitted the final drawing, I'm waiting for feedback from the Artistic Director. Depending on what she says, I may have to make changes to the drawing and re-submit. More 'Grannie's Coal Pot' updates to come. I'm happy to share that I'm currently working on my first publishing project. No, it's not my very own picturebook (as we say in the Caribbean, soon come! ), rather, my poem 'Grannie's Coal Pot' is carded to appear in an illustrated anthology of children's poems and stories to be published by Reflection Press. The anthology grew out of the "Heart of It: Creating Children's Books that Matter" online children's writing and illustration course that I did earlier this year. At the end of the course, students were given the option of submitting work to this anthology and I decided to go for it. I'm happy, and I might add proud, to be taking my first baby steps into the world of children's publishing with a small, independent publisher whose mission and values I share. 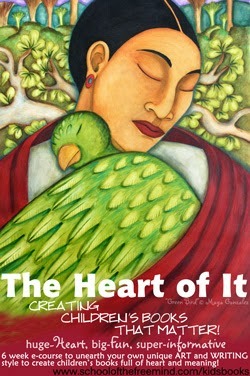 The anthology will feature the writing and art of twenty-nine author-illustrators from around the world, and it will be edited by Maya Gonzalez, Pura Belpre award-winning author-illustrator of My Colors My World/Mis colores, mi mundo, I Know the River Loves Me/Yo se que el rio me ama and more (check out Maya's gorgeous books on Amazon). I'll also be doing an illustration to go along with the poem, another first for me. Partly because I need the moral support and partly to give you a window into what it's like to work with a publisher on a children's book project, I'll be blogging about the process from beginning to end as I go along. Here's what's been going on so far. The first stage of the process was the manuscript review. Back at the beginning of June, I submitted the manuscript electronically as a Microsoft Word document. Not all publishers accept electronic submissions, but at Reflection Press they're really committed to leveling the playing field in terms of providing equal access/equal opportunity (not everyone can afford the costs associated with sending snail mail submissions) and electronic submissions is one way to work toward that ideal. Because this anthology will be printed at 8.5" x 5.5" trim size (also known as "digest size"), and I'm getting one double-page spread (i.e., two facing pages designed to be seen together, the illustrations or text forming one whole design, also known as a "two-page spread" or "full spread") for text and illustration, there was a strict word limit. My poem was actually a wee bit over the limit and I made sure to let the Editor know that. As will usually happen, the Editor then sent me back a brief providing feedback for revisions. Most editors will provide a written brief, but in my case, Maya sent me a fifteen-minute audio review- a nice personal touch to hear her voice! The audio review helped me finalize the text of the poem. This involved tightening up the language in some places, and re-phrasing in others to bring out the meaning and imagery more clearly. In the end, the poem flowed better (I could hear that reading it aloud; it's always important to read your writing aloud) and I just felt better about it. Maya is an Editor who really encourages you to pay attention to the heart- a writer's emotional connection to the story. There's an intuitive knowing that happens when you know in your heart that it's right. It would be remiss of me if I didn't mention that I'd initially titled the poem 'Grannie's Pot'. The Editor pointed out that the word 'pot' is synonymous with marijuana here in the US, which is where the book is being published. Good catch! It's not my intention to write anything subversive (at least not with this poem!) so I'm glad they caught that. I'm lucky to have an Editor who believes in supporting me as the writer/illustrator in listening to my own voice and in becoming more free and strong in my creative expression. Besides, Maya has a wealth of experience working in children's publishing and a strong vision for supporting voices that aren't typically represented in mainstream publishing. I trust her and felt comfortable accepting all her suggestions. It's important to note that an editor's brief (or, for illustrators, an artistic director's brief) is for guidance only; everything is still open to change and the final decision rests with the author/illustrator. If a publisher wants to make changes to your work to the extent that you feel your vision for the story is lost during the editing process, you're always free to part ways with that publisher, although you'll want to be sure to do so amicably. At the same time, it's good to remember that editors and artistic directors are there to help bring out the best in your work, so make sure you're open to what they have to say. After resubmitting the manuscript, I got an email informing me that the final text had been approved. Yes! At that point, the process of translating the poem as art began. The next step then was to submit a rough thumbnail, which I did earlier this month. The rough thumbnail is just a small initial sketch to give the publisher/the book's artistic director an idea of your basic vision for an illustration. It's a very elemental preliminary drawing for brainstorming purposes. As you can see, my rough thumbnail is very rudimentary. This is me just starting to feel things out, just playing with possibilities and figuring out how I want to structure the image. This is the rough thumbnail I eventually submitted after doing a few. A few days after submitting it, I was emailed a brief written review with some suggestions for revision. One of the suggestions was that I add shadows on the wall behind the figures, a great idea because the word "shadows" is used in the poem, as is the word "night". After getting the thumbs up (pun intended) on that initial thumbnail, I then had to submit a final thumbnail, which I did last week. The thumbnail stage is for sorting out the technical, layout and design issues of the spread. It's the publisher who decides how the text and art will appear on the page and who guides the layout aspects of the book. For example, the publisher will suggest whether a particular spread should be a “full bleed” (a single illustration running to the edges of the page as opposed to an illustration with an illustrated border or white space around it), two separate illustrations, or a series of smaller vignettes. The publisher will also determine which pages will be left blank (white background) for text, and places where text will be integrated into the illustrations. In the case of this anthology, we were offered three design options for our double-page spreads and because my poem contains a lot of text relative to the small trim size this book will be printed in, I chose the half spread page, as you can see in my final thumbnail below. As you can see, we were given templates to work with for our thumbnails. The thumbnail template is a working design to help me, the illustrator, begin to see where any issues with the layout might lie. In book layout, elements like the trim line (where the edge of the page will be cut), the gutter (the part of the book where the pages are bound), the text space (the area of the page where the text will appear) all affect the decisions I will make in terms of how I structure the different elements of an illustration. I want to make sure all the important elements of the illustration are within the proper margins/the trim box (also known as the "safe zone"), and I want to make sure that nothing important crosses or gets cut off by the gutter. The thumbnail template helps me to "see" the final layout clearly so that I know what I'm about when I go on to the next stage: the final drawing...which is what I'm working on now. I've also been asked to submit an additional spot illustration, i.e., a small independent piece of art that would relate to my spread image and that would appear on other pages of the book as an extra design element. So I'm working on that too. I'm having a lot of fun learning and experimenting with the art. More updates on 'Grannie's Coal Pot' to come. 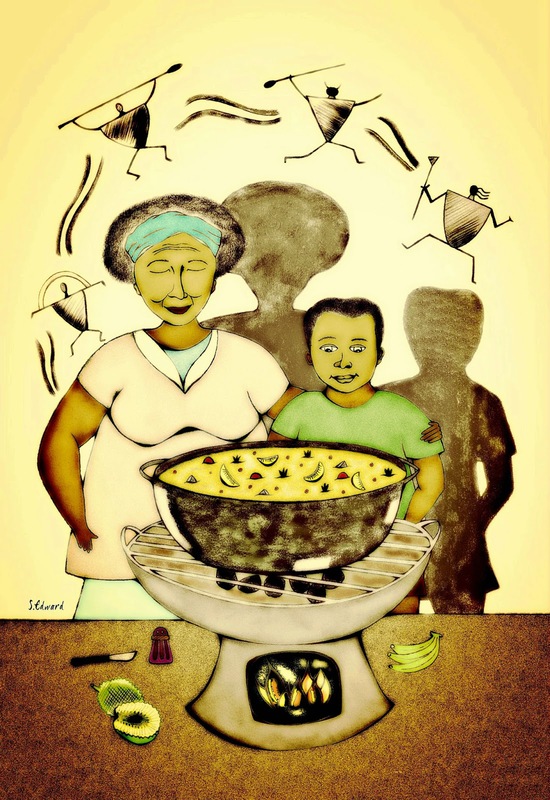 I write and illustrate children's stories and poems inspired by memories of my childhood in the Caribbean island of Trinidad; I write for adults as well. I'm also a Caribbean/Caribbean diaspora children's literature specialist and curator of a monthly Publishing Perspectives interview series which can be found here . Here are some books that I've had the pleasure of working on. More here. In April 2015, I’ll be co-facilitating a creative writing workshop for children with award-winning children’s illustrator Colin Bootman as part of the Bocas Lit Fest Children’s Programme. I will also be reading my children’s poetry and story to young audiences at the National Library in Trinidad. Click here to view my schedule on the Bocas Lit fest website. 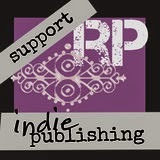 Check out my Publishing Perspectives interviews. Insights from both sides of the publishing fence ―from the people who work in publishing and the writers working toward publication. This blog remains ad-free and takes many hours a month to research and write. If what you see here is helpful to you, please consider making a small donation in any amount.